Recently we were asked in the #freenet IRC channel, whether we have a copy of the trust graph in the Web of Trust plugin (which provides service discovery and spam protection). While there is an easy way to get the non-spamming identities directly from the plugin (see wotutil), I decided to take the opportunity to do some Guile hacking: Crawling all the identities to dump a full copy of the trust graph. This also gives us IDs which are marked as spammers, and consequently ignored by the Web of Trust plugin. So, firstoff, this is how the whole trust graph looks, about 13,000 identities and 250,000 trust relationships, with the size of the nodes showing the analyzed hub-value of the identities and the color showing the Eigenvector Centrality. 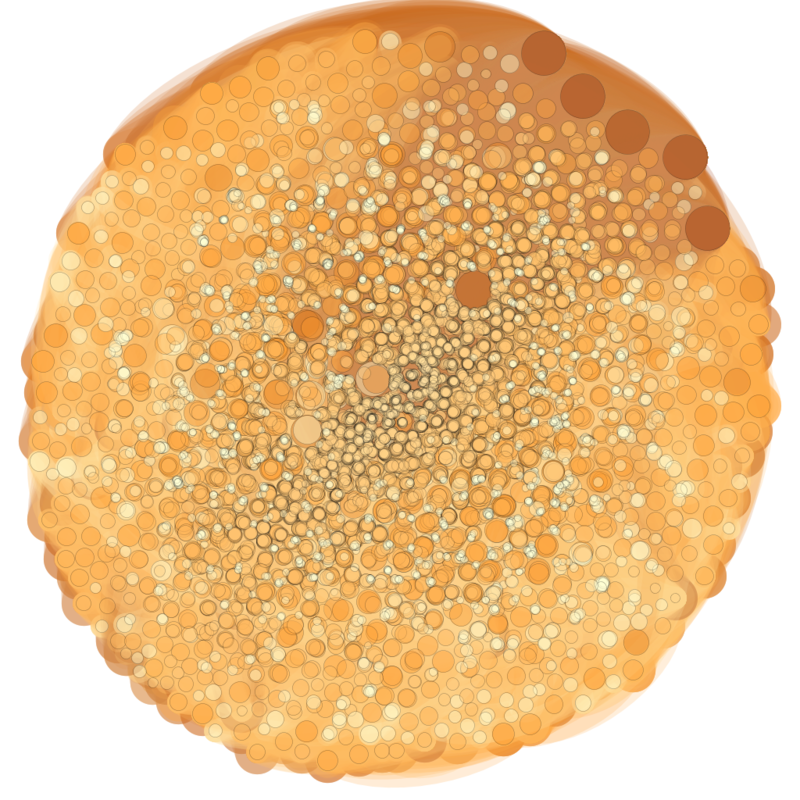 Many of the nodes overlap, since the graph layouting in Gephi took hours to optimize it. I will not investigate all the details here. Instead, the files trust-deduplicated.csv and trust-sone.csv contain anonymized snapshots of the edges in the Web of Trust graph which can be loaded in common graph analysis tools. The first contains all trust values, the second only those which were set by the anonymous social network Sone, which indicates that the user saw at least one message of the other user. An example of the investigations which can be done with this dataset is the following graph, where I let Gephi split the graph into communities using clustering analysis. 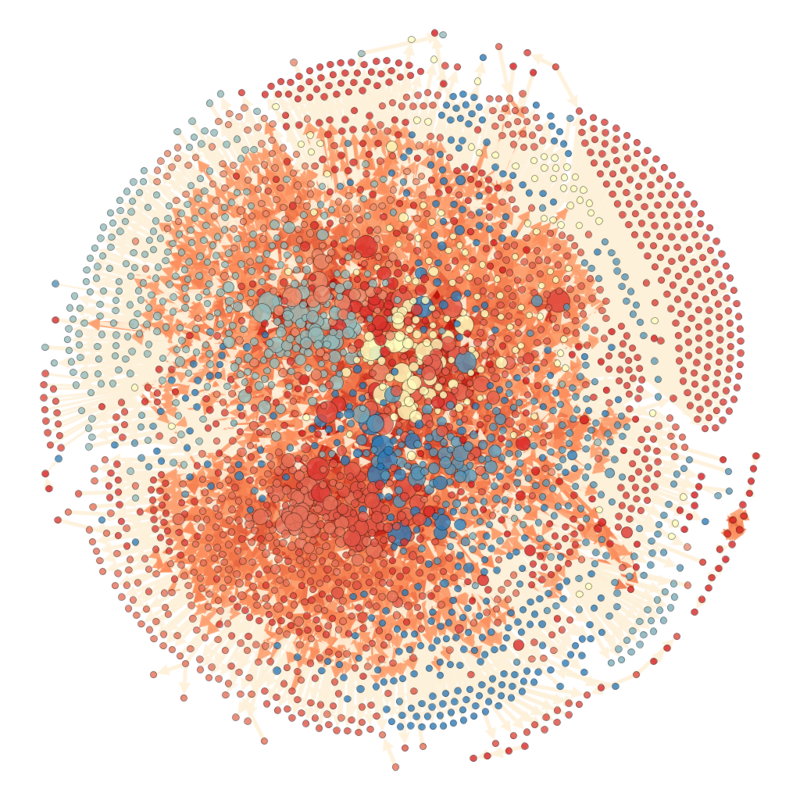 The colors indicate the community, while the size of the nodes shows the hub-value and the color of the connections shows the betweenness. This uses the Reingold layout. It’s already visible, that there are communities where the trust connection is realized by only a single node which trusts many others, but that there is also a well-connected center. If you use this dataset, for example to investigate social interaction or the effects of anonymity, please drop me a note and reference the Freenet Project and me (Arne Babenhauserheide). I release the csv files under cc by. If you use my Guile Scheme scripts (with the scm suffix) for research, I hereby grant the additional permission to use them under cc by, too. This should make it easy to comply with releasing your scripts and data as Open Access.